What are the valence orbitals of transition metals? The transition metals are also referred to as the d block because their valence orbitals are the d shell (see illustration on this page). 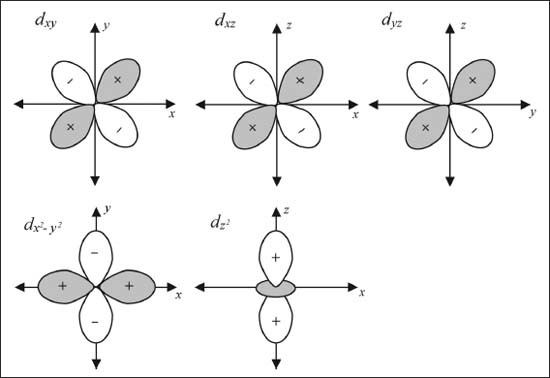 There are five different d orbitals. Three (dxy, dxz, and dyz) of these five look similar, just with different orientations in space. The fourth (dx2-y2) has the same shape as the previous three, but the loops point in along the axes as opposed to between them. Finally the dz2 looks like a p-orbital pointed along the z-axis with a ring (technically a torus) around it. The five different valence orbitals of transition metals.